Cognitive and Behavioral Consultants co-founders, Drs. Alec L. Miller and Lata K. McGinn recently celebrated the grand opening of the Schwartzberg Training Center, a new mental health training facility in White Plains. 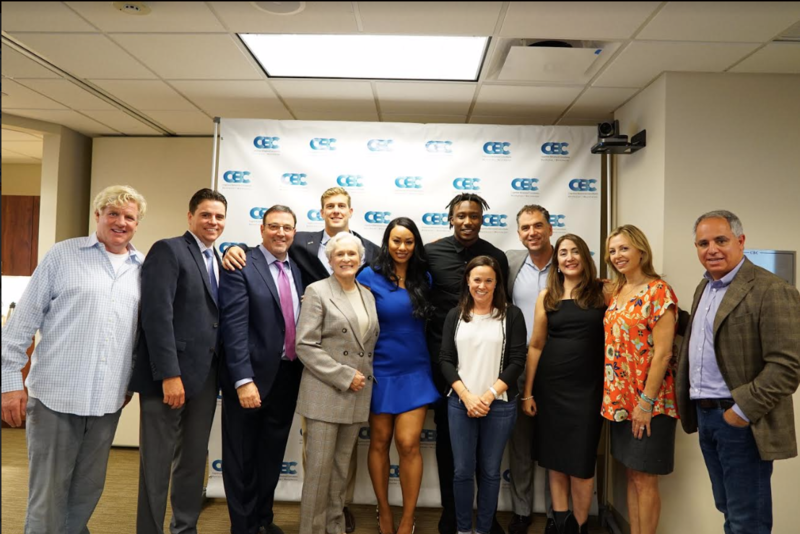 Sixty colleagues and friends attended the event including Harris and Nicole Schwartzberg for whom the Center is named, and mental health advocates actress Glenn Close and New York Giants wide receiver Brandon Marshall. The opening of the Center comes at a time when mental illness is in the headlines with the rise of severe anxiety among teenagers, noted author John Green’s account of his struggle with Obsessive-Compulsive Disorder, as well as the recent announcement that Saturday Night Live's Pete Davidson has been diagnosed with borderline personality disorder, a serious mental health condition often confused with bipolar disorder. One person commits suicide every 12 minutes in the United States and depression is now the leading cause of disability costing over $1 trillion to treat worldwide, further underscoring the importance of providing clinical services and training for professionals in research supported psychotherapies like CBT and DBT. McGinn and Miller co-founded Cognitive and Behavioral Consultants (CBC) in 2004 after meeting early on in their careers at Montefiore Medical Center. With offices in Manhattan and White Plains and a team of 30 professionals, they offer clinical services in both Cognitive Behavioral Therapy (CBT) and Dialectical Behavioral Therapy (DBT) as well as newer services in Parent Child Interaction Therapy (PCIT), trauma focused treatments, neuropsychological testing, and executive functioning to name a few. Drs. McGinn, Miller, and their team, travel the world speaking at conferences about mental health disorders, treat patients in both locations, consult to schools and corporations, and now conduct intensive training for other professionals at the Schwartzberg Training Center at CBC based in Westchester. "Harris and Nicole Schwartzberg's generous contribution has made this Training Center possible and thanks to their support we will now offer training for both professionals in the mental health field as well as parents, school administrators, teachers, and corporate executives," stated Alec Miller. Harris Schwartzberg and his wife Nicole were on hand to unveil the plaque and cut the ribbon. The Center, located at 1 North Broadway in White Plains (https://www.cbc-psychology.com/ ), was funded by Harris Schwartzberg, CEO, of The Schwartzberg Companies, a private investment firm with a focus on healthcare operating companies and real estate. Schwartzberg and Miller met at University of Michigan and, as an advocate for mental health issues, Schwartzberg wanted to help bring training to others and funded the Center. Also on hand were actress and activist Glenn Close, founder of Bring Change 2 Mind http://bringchange2mind.org a nonprofit dedicated to encouraging dialogue about mental health and to raising awareness, understanding and empathy, and New York Giants wide receiver Brandon Marshall who was diagnosed with borderline personality disorder in 2011 and co-founded Project 375 (www.facebook.com/project375<http://www.facebook.com/project375>) . Artist Peter Tunney http://www.petertunney.com/ was also on hand for the grand opening. His positivity artwork is on display on the walls of the Schwartzberg Center as well as around the world. Three school administrators were also on hand for the grand opening and have worked with the staff at CBC to assist children and parents in their districts: Dawn Catucci, School Psychologist for Ardsley High School, Joseph Hochreiter Superintendent for Hendrick Hudson School District and Neil Boyle Coordinator for Putnam and Northern Westchester BOCES Guidance and Child Study Center. More information about CBC's services for parents, children, schools, mental health professionals, and businesses can be found at www.cbc-psychology.com or by calling 914-385-1150 in Westchester or (212) 595 9559 in Manhattan. Current training sessions and classes are listed on the website. Offices are located at 1 North Broadway in White Plains and at 320 Central Park West in New York City. CBC provides a large array of Clinical and Wellness services to the public and builds on these methodologies to provide custom designed programs to schools, agencies, and businesses, as well as Continuing Education for Professionals in the field of clinical psychology. Left to Right: Artist Peter Tunney, Neil Boyle of Putnam and Northern Westchester BOCES Guidance and Child Study Center, Co-Founder of CBC Dr. Alec Miller, actress and activist Glenn Close, Will Heininger, director of the University of Michigan community outreach center, Michi Marshall, wife of New York Giants wide receiver Brandon Marshall (to the right of Michi), Nicole Schwartzberg, Joseph Hochreiter, Superintendent for Hendrick Hudson School District , Dr. Lata K. McGinn Co-founder of CBC, Dawn Catucci School Psychologist for Ardsley High School, and Harris Schwartzberg who funded the Center along with his wife Nicole.